1Support for offshore drilling plummeted after the 2010 spill, but has largely recovered since. Between February and May of 2010, the share of Americans who favored more offshore oil and gas drilling fell from 63% to 54%. By June, support dropped another 10 percentage points and more people opposed increased drilling (52%) than favored it (44%). But support rose subsequent years, though not to the same heights. 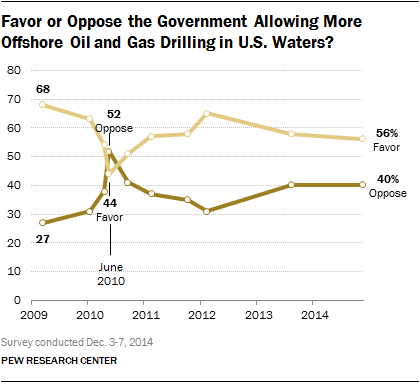 Last December, 56% said they favored the government allowing more offshore drilling and 40% opposed the practice. In that survey, about three-quarters of Republicans (77%) favored more drilling, as did 55% of independents. Only 41% of Democrats favored more drilling, including just one-in-three liberal Democrats (33%). 2The months-long BP story was one of the two biggest stories of the year in terms of news interest. In the week ending July 25, 2010 – shortly after BP said it had capped the leak and just before the resignation of CEO Tony Hayward – fully 59% of American adults were following the Gulf leak very closely. The only story as closely watched in 2010 was that of another disaster, the January earthquake in Haiti (60% paid close attention at the peak). 3Public interest went hand-in-hand with the vast amount of news coverage of the spill. The Gulf spill was the most covered news story in nine weeks out of a 14-week period studied by Pew Research Center. Our study of media coverage from April 20 to July 28, 2010, showed that the spill accounted for 22% of the newshole (almost double the next-biggest story) and generated 31% of cable news airtime. 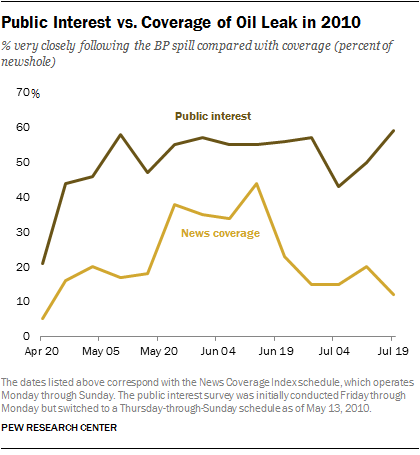 Public interest in the news remained high, even in weeks when news coverage dropped off; in 13 of those 14 weeks, the public followed the story of the spill more closely than any other. 4The public trusted news organizations more than the federal government and far more than BP for information about the leak. About half (52%) said in July 2010 that they had a lot or some trust in the information about the spill coming from the federal government; just about one-third (34%) said the same about information from BP. 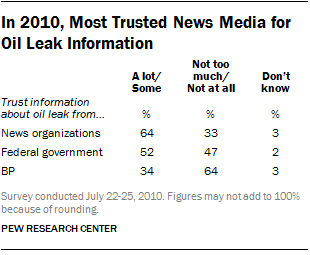 News organizations received the most confidence from the public, with 64% saying they trusted at least some of the news organizations’ information about the spill. By July, though, the public had grown weary of the amount of coverage. Although about half (49%) said news organizations were giving the story the right amount of coverage and 18% said there was too little, 31% at that point said it was too much coverage, up from 14% two months earlier. 5While support for offshore drilling has largely rebounded, many Americans also support investments in alternative energy. By a two-to-one ratio, a greater share of the public favors developing alternatives like wind, solar and hydrogen over expanding ventures into oil, coal and natural gas (60% vs. 30%). 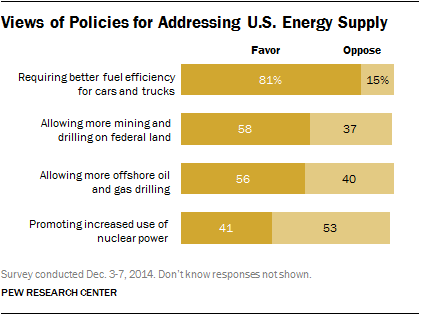 In fact, the public takes something of an all-of-the-above approach to energy: 81% support better fuel-efficiency requirements and 58% want more mining and drilling on federal land. An additional 41% would favor the government promoting the increased use of nuclear power.